Mexico beat Panama in a World Cup qualifier last week but struggled throughout the qualifying campaign. 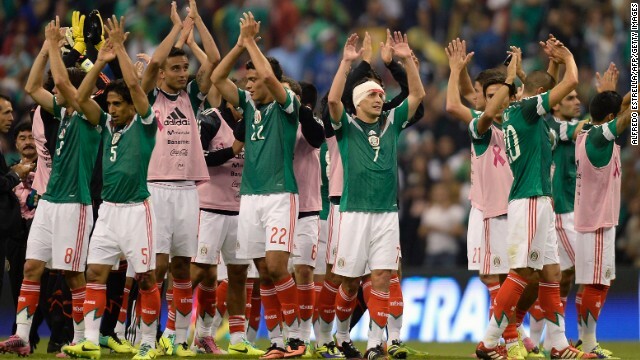 (CNN) -- Coaching the Mexican national team is proving to be a difficult assignment. When Mexico parted company with Victor Manuel Vucetich and replaced him with Miguel Herrera on Friday, it marked the third time in a month El Tri changed their football manager. Vucetich didn't have much time to mold the side, as he was only brought in when interim boss Luis Fernando Tena got the boot. Tena himself inherited the position after Jose Manuel de la Torre received his marching orders earlier in September. Vucetich won his first game 2-1 against Panama, needing a late goal to earn all three points, but lost his second 2-1 at Costa Rica. Mexico, a proud footballing nation that has appeared in the last five World Cups, won men's Olympic gold in 2012 by topping Neymar's Brazil and captured the under-17 World Cup in 2011, only scraped into a World Cup playoff when fiercest rival the U.S. scored two goals in injury time to beat the Panamanians 3-2 on the road. Had Panama hung on for the victory, it, not Mexico, would have faced New Zealand next month in the two-leg shootout to reach Brazil. Vucetich, who has 25 years of coaching experience, likely didn't help his cause ahead of the game against Costa Rica when he labeled his team "arrogant." "In our game, sometimes we exaggerate, we become arrogant," he told reporters. "I think this is the moment that we should reflect and show, above all, on the pitch that we need to win." Vucetich revealed Thursday that he had been axed, with Mexico's football federation officially announcing the coaching shuffle Friday. Mexico's struggles in qualifying came as the U.S. topped the group, Costa Rica finished second and Honduras claimed the third and final automatic World Cup spot. While Mexico reached the second round in South Africa three years ago, Honduras was last in its group and Costa Rica didn't qualify for the tournament. On paper Herrera, a former defender for the national team, should lead Mexico to Brazil since New Zealand is ranked 79th by FIFA and Mexico stands 24th but the recent disarray won't hurt the Kiwis' chances of playing at a second straight World Cup. Herrera guided Club America to the Mexican Clausura title in May. Vucetich hasn't been the only manager to lose his job despite his team making the playoffs -- Croatia fired former national team defender Igor Stimac after a 2-1 loss at Scotland. He was replaced by Niko Kovac, the former hard-nosed captain of Croatia. Australia sacked Holger Osieck following back-to-back 6-0 defeats against Brazil and France despite the Socceroos being one of the first nations to book a spot in Brazil.